A Golden Bay school will be switching off its wi-fi network during break times to encourage more face-to-face time amongst its senior students. Collingwood Area School’s move comes as more schools around the country are making the choice to get kids off their phones and social media sites. Principal Caroline Gray said she had been trialling a whole-school social media ban for several weeks. Taking it a step further, Gray said she would start switching the wi-fi network off during break times on the first day of term two. Gray was concerned to see so many of the senior students on their phones during breaks while the sun was shining. She wanted to see them being more active and face-to-face with one another. The excessive screen-time was creating more tension and pressure for them than they needed, she said. Gray said she knew the move was possible having been the principal at Raphael House Steiner School in Wellington, where it managed successfully with very little screen time. “[We did it] because of the lack of information available about what wi-fi does long term. It’s invidious,” she said. The school would be incrementally reviewing the move over the course of the year. Year 12 student Jessie Harland is reluctant about the idea. 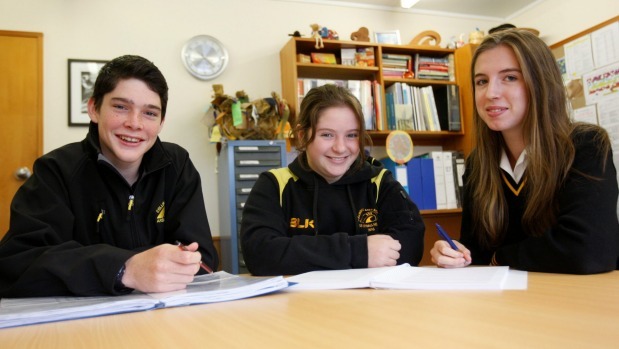 Year 8 student Hayley Page saw the move as positive. “We have a tackle tournament coming up and in the past we did not have enough students from our year level because they rather spend time on their devices,” she said. A paper published by the London School of Economics in 2015 found banning mobile phones in schools resulted in a 6.41 per cent improvement overall in the schools’ performance. Last year, a South Auckland school blocked its students from using Facebook and its Messenger app over the school wi-fi, following a segment on a television news programme about Facebook Live usage in the classroom. In February, a secondary school in New Plymouth started turning off its wi-fi internet network during breaks. It was later reported that the students were saying the move to get kids off their phones had created more problems than it had solved. Many students were spending all their spare money on extra data, while some were too poor to afford it, and others had even found a way to connect to another school network. Gray said switching off the wi-fi was about the kids learning to be, and have conversations, with each other.